Your recent reports, “Warning for outdoor holiday-seekers” and “Doc: Malaysians need to be more civic-conscious” (The Star, 16/3/2015) highlight the challenges faced in keeping national parks and other outdoor recreational areas clean and free of litter. Littering is not just a matter of aesthetics, but one with serious environmental, economic and health implications, especially in light of the increase in leptospirosis and dengue cases. As a volunteer with various environmental organisations, I have coordinated and participated in public clean-up programmes for over 20 years. From my experience,Malaysians are fully aware of the health and environmental problems associated with littering, yet are not motivated to keep recreational and public areas clean, as the prevailing attitude seems to be that “someone else is paid to clean up after me” and “I don’t live here so it’s not my problem”. Once, at an ecotourism event, I observed a group of university students throw junk food wrappers into a wooded slope. When I asked them why they would deliberately mar the beauty of an ecologically sensitive area when there are rubbish bins a mere 100 metres away, they shrugged and responded that they didn’t think it was important, because they would be leaving the same evening and will not be around to witness any harm their litter may have caused. Education and awareness campaigns, therefore, will have little, if any, positive impact on an informed but apathetic population. Different strategies are required to deter littering. 1. Litter begets litter. As long as there is uncollected litter present in recreational areas, people are less hesitant about leaving their litter behind as well. Since most recreational areas collect an entrance fee, effort should be made to collect and remove litter on a regular basis, and to assign staff to monitor the area and fine visitors on the spot for littering. In the long run, this will be less expensive than organising massive clean-up efforts every few months, which will require more manpower and transportation services. At present, the “Penalty for littering” signboards at recreational sites are mere objects of ridicule, with litter deliberately left under the said signs since there is no enforcement of the rules. 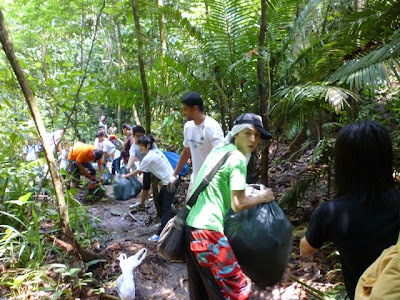 The lamentable thing about most clean-up campaigns in Malaysia is that most of the volunteers are not local to the area, and thus the locals who visit the recreational areas most frequently can afford to remain apathetic. The local authorities, Education Ministry and relevant government agencies should collaborate with environmental organisations to compel the participation of the local communities, particularly those in the neighbouring schools, factories, fishing and farming cooperatives and residential areas, in order that they understand the time and effort involved and the health implications of littering. During one particularly tiring clean-up campaign, a few teenagers from a local school were overheard to moan that they would henceforth kick any of their friends who are spotted littering, since they have put in so many backbreaking hours into cleaning it all up. If we could inculcate a sense of pride and stewardship in the local communities, half the battle would be won. 2. Imposing conditions on the sale of refreshments and other items inside or directly outside recreational areas, since stalls and shops are responsible for a large percentage of litter in picnic sites and parks. Apart from our national parks, most recreational areas fall within the purview of the local councils. The councils should implement regulations to ban or restrict the use of plastic bags and foam packaging, as these form the bulk of the rubbish left behind. Stalls and shops should also be made responsible for the cleanliness of their surroundings, and business owners should be fined for any rubbish within a radius of 50 metres from their stalls/shops that are not disposed of properly. If they fail to comply with these regulations, they could face a fine or be deprived of their right to ply their trade in that area. 3. Local councils and the management bodies of recreational areas must set up a system to charge a deposit on all food and beverage containers and disposable packaging brought into park premises. In order for this measure to be effective, all concession and snack stalls must be outside park premises. Park attendants can check the belongings of all visitors and charge a deposit of, say RM1, for each cigarette packet, plastic bag and food and beverage container or packaging brought into the park at the entrance counter and inform the visitors that they will get their deposit back if they were to bring the items back for disposal upon exit.This system has been implemented with a high degree of success in Mysore Zoo and Bannerghatta National Park in India. Currently, many recreational areas charge visitors an entrance fee, which is ostensibly used for maintenance and cleaning services. This does not deter littering and many recreational areas are in a disgraceful state. It would not cost the local councils or management bodies more to just assign the fee collector the duty of checking bags and picnic baskets for disposable packaging and imposing a deposit sum on them. Visitors who are unable to pay the deposit will be barred from entering the recreational area and be required to consume their food and dispose of their waste and food packaging properly before entering the site. Awareness and education campaigns can then focus on informing the public on the new no-waste policy and advising visitors not to bring disposable packaging into outdoor and picnic sites. To ensure its effectiveness, all unofficial entrances to parks will have to be closed off and the park gates must be closed at night, not only to maintain the cleanliness of the area, but also to prevent the parks from being utilised for vice, illegal activities and drinking sessions after which broken bottles are left lying around. 4. There should be a national policy to impose a higher fee on plastic bags and Styrofoam packaging to reflect their cradle-to-grave cost and the true environmental cost of cleaning up clogged drains and rivers. This will, in turn, encourage manufacturers, retailers and consumers to look for alternatives to disposable and non-biodegradable packaging. The plastics industry often argues that the improper disposal of plastic waste is a result of aberrant behaviour, namely, littering, rather than an indication that plastic products cause harm to the environment and wildlife. If such is the case, then the banning and restriction of sale and use of plastic bags, polystyrene packaging, and excessive packaging of any kind will greatly reduce the opportunity for such "aberrant behaviour" to happen in the first place, especially since plastic bags and foam packaging frequently get blown away from picnic sites into waterways and seas. 5. Instituting a nationwide deposit system for recyclable items such as aluminium cans, PET bottles and beverage cartons. The cost of purchasing packaged food and beverages in Malaysia does not reflect the cost of disposing of them and managing the waste generated. If a 20-sen deposit were to be charged for each unit of recyclable packaging, which will be claimable at designated recycling centres, it would create an incentive for people to collect and redeem their recyclables for cash, and also create economic opportunities for scrap material collectors. This would also translate into less litter ending up in public and outdoor spaces. Ultimately, this will reduce waste collection and transportation costs, as it will be the consumers who bring the items in for recycling themselves, instead of waste collection agencies being engaged to carry out such services. One of the problems with recycling and waste management efforts in Malaysia is that manufacturers are not made responsible for the environmental consequences of their products. If manufacturers were made to pay for the cradle-to-grave environmental cost of their products, then ease-of-recycling would become a design criterion, and there would be greater incentives to explore closed-loop production cycles and to create products with a high percentage of recyclable or post-consumer recycled content. Unless there is a solid and predictable market for recycled and biodegradable products, private companies will not invest in the facilities to recycle, and market prices for recycled and biodegradable products will fluctuate. Our lack of pride in our outdoor spaces and lack of concern for the environment reflects how we view ourselves as a society and nation. Measures to inhibit littering must include both penalties for littering, as well as motivations to reduce waste and to encourage the public to take pride in their surroundings. We need to take ownership of our community and public spaces by taking responsibility over them.